The Able Trust held its first Youth Leadership Retreat at the Omni ChampionsGate Resort last month. 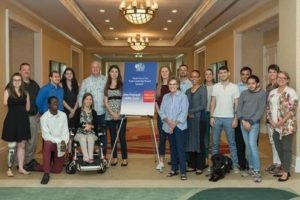 Thirteen exceptional young adults with disabilities from around the state, including Rachael Christian and Pastiche Graham of Orlando, met to provide insight into the knowledge and skills young adults would like to have as they move into the workforce. The 2018 Youth Leadership Retreat was designed to gather information directly from the young adults with minimal outside influence. Dwayne Ingram, Operating Partner at Morgan Hill Partners, and Ambassador for The Able Trust, moderated the event. The attendees participated in various exercises and workgroups that helped them look at and analyze what leadership skills and knowledge they thought were important now and when they first started their careers. Attendees also developed an agenda for a youth leadership program they would like to see held and presented their ideas to the other attendees. The Able Trust also will meet with business owners to garner their input into the knowledge and leadership skills they would like to see in young adults who are current or potential employees. The information gathered at these two events will be used to revise The Able Trust’s youth leadership program for 2019 so it better meets the needs of the youths participating in the program and the businesses of the state. Since 1998, The Able Trust has been providing youth leadership programs to young Floridians with disabilities in the form of the Youth Leadership Forum (YLF) and through the nationally acclaimed High School High Tech (HSHT) program. The HSHT program is operated at 43 sites in 40 counties and boasts a graduation rate of 99% of those eligible. The Able Trust is a 501(c)(3) non-profit organization. Its mission is to be a key leader in providing Floridians with disabilities opportunities for successful employment. The Able Trust supports numerous diverse projects; including the High School High Tech program, youth leadership training, work experience training and technical assistance, transportation assistance, career development training, employment and career path direction, and assistance to businesses as they seek the employment of people with disabilities. Since its beginnings, The Able Trust has worked with community organizations in every county in Florida to put thousands of people with disabilities to work.